A week or so ago I reviewed a book called the Doomsday Men - an all-encompassing cultural history of the weapons of mass destruction by P.D. Smith. I am delighted that he has now agreed to answer a few questions about his impressive book and the usual general questions. P.D. 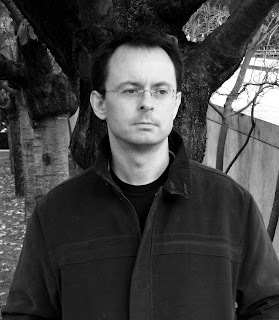 Smith is an independent researcher and writer. 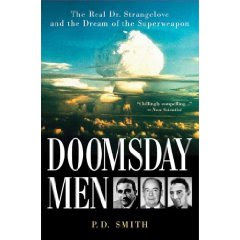 His most recent book is Doomsday Men: The Real Dr Strangelove and the Dream of the Superweapon (Penguin, 2007; St Martin's Press/ US; Companhia das Letras /Brazil). He is currently writing a cultural history of cities for Bloomsbury, and an essay '‘Gentlemen: You are mad!’: Mutual Assured Destruction and Cold War Culture' is due to appear in ' The Oxford Handbook of Postwar European History', edited by Professor Dan Stone. His previous books are Metaphor and Materiality: German Literature and the World-View of Science 1780-1955 and a biography of Einstein (Haus, 2003). He has taught at University College London where he is an Honorary Research Associate in the Department of Science and Technology Studies. He regularly reviews books for the Guardian and the Times Literary Supplement, and has also written for the Independent and the Financial Times among other journals. He lives in Hampshire. Questions about the Doomsday Men. CD: You give various contenders for the 'award' of atomic Dr Strangelove. Who would you choose for the title? PDS: Peter George, the British author who wrote the novel and the screenplay on which Stanley Kubrick’s film is based, clearly had Hitler’s rocket scientist, Wernher von Braun, in mind. What’s great about Dr Strangelove is that he’s an amalgam of scary figures, both fictional (e.g. Dr No or Rotwang) and real (e.g. John von Neumann, Herman Kahn). But if you pushed me, I’d have to say physicist Edward Teller, aka ‘Mr H-Bomb’. His plans for new nukes and their uses were truly Strangelovean. CD: Your book is the fullest account of the evolution of weapons of mass destruction that I have ever encountered. How long did it take you to do the research and write the book? PDS: From signing the contract to publication took three years. Obviously there was a fair bit of what you might call research & development before that. CD: It is also full of fascinating facts such as Winston Churchill's use of chemical weapons against Iraq in 1920. Are there any pieces of information that were particularly difficult to find, and therefore a bit of a 'coup'? PDS: The story of the cobalt bomb had not been told before. It was perfect to illustrate my broader theme about how fiction and science merge in the history of what we now call weapons of mass destruction. So the main research challenge was to search through the newspapers, journals and popular culture from 1890 to 1965, tracking down references to scientific superweapons, saviour scientists and mad scientists. Every time I came across a mention of the cobalt bomb I was barely able to suppress a Strangelovean cackle! CD: Which of the scientists you describe do you particularly admire? PDS: Einstein’s friend, Leo Szilard. I first came across Szilard while writing a biography of Einstein in 2003. He was such an intriguing character – a scientist, inventor, activist and even a writer of short stories. One friend described him as ‘an extraordinarily sweet and calmly desperate genius’. Another friend said he was ‘the inventor of all things’ because he was constantly fizzing with new scientific and technological ideas. One of these was the cobalt bomb, a doomsday device that could spread lethal fallout around the whole world. But he was an idealist, not a Strangelove. The C-bomb was meant to shock people out of the arms race. In the cold war he became a one-man peace movement lobbying scientists and politicians. He was dynamic, outspoken, and brilliant, but at times he could also be infuriating. A true genius! CD: Were there any scientists you could not understand at all - in terms of what they did? PDS: The Japanese microbiologist Shiro Ishii. His work developing biological weapons for the Japanese military during the 1930s and 40s involved the most appalling crimes against humanity. He escaped prosecution only because the Americans wanted to use his research in the cold war arms race with the Soviets. CD: A unique aspect of the book is the way you have brought in popular culture. It seems that some of these authors, like HG Wells, inspired the imagination of these scientists, and so in some way were partly responsible for what happened - as some of what they predicted came true. Do you think the same might happen today? Can you think of any speculative writer today that might be having a similar influence - or has that time passed? 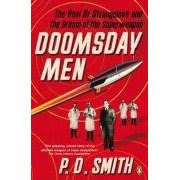 PDS: At the heart of Doomsday Men is our culture’s misguided belief that there are technological solutions to human problems. Authors helped to create that myth. In the first half of the twentieth century, their stories and novels popularized the idea that atomic energy and the superweapon would abolish war and bring about Utopia. But, as films like Dr Strangelove show, such idealism was in short supply during the cold war. Today I hope we’re a bit more skeptical about what science can and can’t do. But speculative fiction remains very influential in society. In fact, US government departments actually consult science fiction writers like Greg Bear on matters such as possible future terror attacks, as the Washington Post recently reported. CD: I thought the epilogue, where you describe your family history gave a satisfying and personal touch to the story. Did your research help you to understand the contrasting attitudes of your family to war? PDS: Yes, that was unexpected. My grandfather was in the Grenadier Guards and fought in France throughout World War I . He saw action at Loos where the British used the new German superweapon, poison gas, for the first time. He never talked about the horrors of trench warfare, but his son – my father – later became a pacifist and as a young man took part in CND marches. It was a powerful reminder that in the end history is about ordinary people – fighting in the trenches, taking part in protest marches. They’re the ones who suffer when the calculations of the Dr Strangeloves go wrong. PDS: Holding the hardback copy of Doomsday Men. PDS: Sorry – can’t think of one! PDS: Finding out that my father had cancer. PDS: Switch on the Today Program on Radio 4. There is a radio interview with P.D. Smith on Imperial Radio here. Very enjoyable interview! It added to my appreciation of the research behind the book. Mistress of Nothing by Kate Pullinger. The Exquisite Corpse of Science.